Simply put. I love this backpack. It is rugged and feels like it will hold up to the abuse I normally put my backpacks through. I seems to hold everything a little higher which makes any amount of weight put in it feel far lighter than it actually is. I would recommend this to anyone who puts their backpack through a lot. It is well worth the money. Whether you're transporting electronics, tools, or other accessories, this Loaded Gear GX-500 Crossover Utility Backpack from Barska is the perfect pack. The GX-500 features one main storage compartment that contains a padded sleeve for laptops or other electronics, and two smaller compartments to provide storage for additional items. 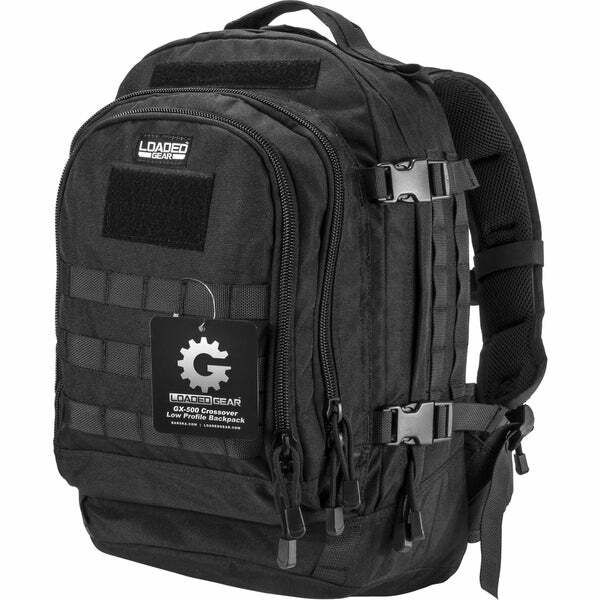 The Loaded Gear GX-500 Crossover Backpack features padded ergonomic shoulder straps and a padded back that allows for ventilation. A MOLLE system is integrated into the exterior of the back of the GX-500, which allows the user to attach additional modular units and pouches. Well made with lots of room and compartments. Durable zippers and lot of space for attaching accessories. Very good for the price and should last for years rather than the usual 1 or 2. Plenty of room for everything you might need to travel, hike or go to the gun range. Pockets, and loops make it easy to carry a lot of items. Easy on the back with the padding and equal distribution of weight. Very durable backpack, great price as well. Will definitely purchase another if this one ever wears out. If your looking for a rugged backpack with plenty of storage, this is it. The back pack seems fine. I'm a slim 250 lb. male and the lower waste band was not long enough. I'm sure most all the packs are the same way. Barska's customer service came through with an additional strap for *** . Purchased this backpack for an employee giveaway at a new asset in California. Great product, clean shipping and the team was pretty excited about it (and the $$ I put in it). To the O.co team - stay on sky miles shopping! Great size, thick and durable. Offers the ability to extend its use by adding other packs. Chest clip and waist clip. Also, has many pockets, big and small which make it good for everyday use, hiking, biking, etc. I love this backpack. You can carry a lot of weight and it still feels very comfortable. Exceptionally made. Would order this again. Lots of room. very well mad! "How many liters is the pack?" "What's the size of the patch in the front of the backpack?" I need a reliable back pack for work.